When the building was first opened in 1931, it was used as a gymnasium that could hold up to 5,000 people. 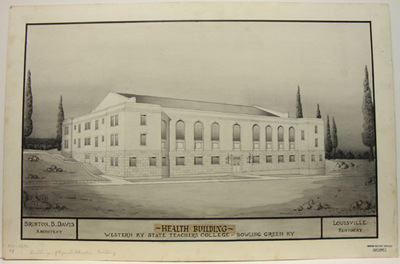 During the last basketball season in the Health & Physical Education Builidng, the building was erroneously referred to as the "Big Red Barn" in several newspaper articles. Upon the completion of Diddle Arena in 1963, the building was renovated into a 70,000 square foot library to accomodate over a 1/2 million volumes on three floors with a seating capacity for 1,000 students. The building also housed the Library Science and Industrial Arts departments along with librarians. The library was dedicated on October 14, 1967. For information on University Libraries see also: Recitation Hall, Cedar House Gordon Wilson Hall Kentucky Building and Cravens Graduate Center & Library. "Hilltoppers to Play First Home Game Sat. Night," Jan. 14, 1937. "Western Fans May 'Reserve Seats'," Jan. 14, 1937. "$1,015,000 Low Bid on Library," July 1, 1964. Borrone, Bert. "It Says Here," Jan. 6, 1956. Hunter, Wales. "Doing It By the Book," photo, April 16, 1995. "Renovations Will Close Helm-Cravens Library," Dec. 7, 1995. "The Last Hurrah for a Grand Tradition," Dec. 6, 1963. "Western College Officials Find House Moving Simple in Comparison to Relocating Library," Aug. 1, 1965. "WSC to Rebuild Old Gym Into Library," Jan. 12, 1964. Duncan, Tom. "Western Tripling Library Space," Jan. 12, 1964.